About 48 hours ago, the blog below was written, indicating the potential for some winter weather on Sunday afternoon, followed by a cold snap that would rival some we see in the middle of winter. This serves as a short update to that info (scroll down to the Sunday/next week sections below for the original post). As of this afternoon, now less than 48 hours from the arrival of the Arctic cold front, little has changed from what I wrote below. 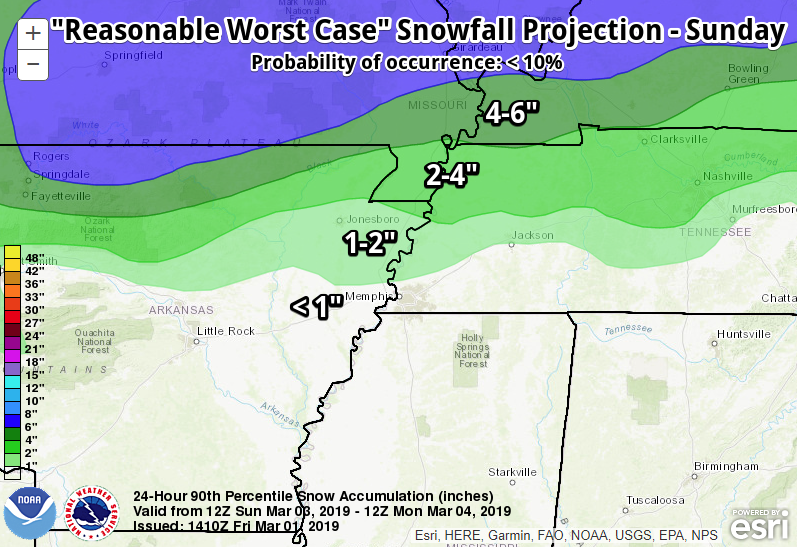 We have a couple more models available that cover the time period in question, and the American GFS model continues to be the one that keeps precipitation around the longest versus the European model and now the high-resolution North American model. However, we are narrowing in on what I believe to be the likely solution, and snow-lovers won't like it. 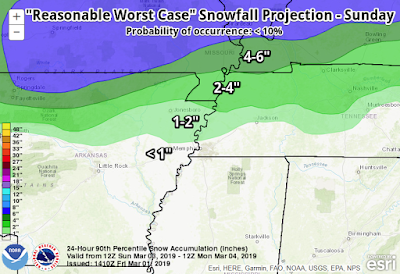 We will indeed see a scenario where cold air "chases out" the precipitation, meaning that the only way to get snow will be where the cold air catches up with lingering precipitation. That is most likely to occur north of the metro. By Sunday mid-afternoon, as temperatures are dropping into the 30s, rainfall will be departing to the east. As for the cold air... well, that IS happenin'! Next week will feel more like January than March. Plan on more hours below freezing than above from overnight Sunday night through mid-day Wednesday! Overnight lows will be closer to 20° than 30° Monday through Wednesday mornings and we may not rise much above freezing Monday afternoon at all. Couple that with a brisk north wind and the Arctic blast will feel like single digits Monday at the bus stop! Plan now to protect any outdoor vegetation that you want to keep starting Sunday night and lasting a few days. Expect the temperatures to recover pretty quickly though by Thursday and Friday (as precipitation chances return, of course). Sorry for the bad news, but I'm ready for spring, so let's get this out of the way and get ready for some spring thunderstorms and rainbows! The past few days have been an opportunity to dry out, and while we end the week with rain chances, they are fairly low, and rainfall should remain fairly light. 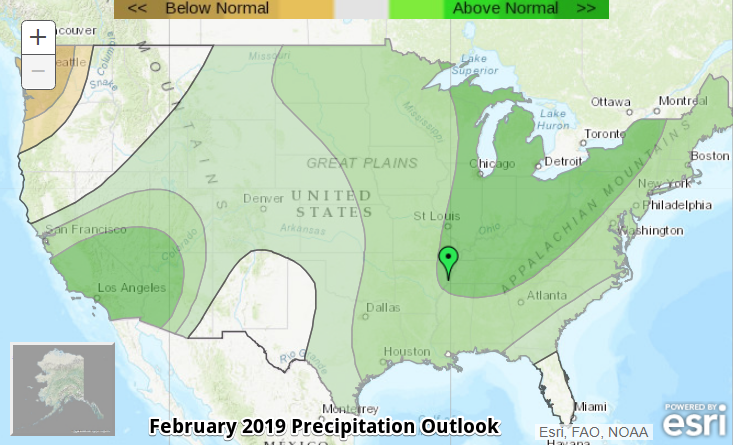 That will provide more time for the ground to dry out a bit and local streams, creeks and rivers to return to their normal streamflow - unless they lead directly into the Mississippi River! 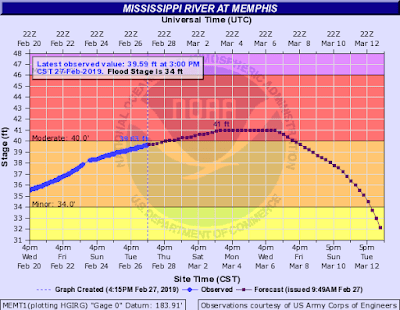 With the river nearing 40 feet on the Memphis gauge, portions of the Wolf and Loosahatchie River and Nonconnah Creek will still remain high as water backs up from the main stem. A cool front is moving south across the Mid-South this afternoon and will bring an end to the mid 60s we've had today as it drops into north MS. There will be low rain chances this evening, but rain will remain light and many residents of the area will see nothing at all. With the front stalled in the region, we can expect more cloud cover the next couple of days, small rain chances Thursday morning and again Friday into Friday night, and cooler, but not cold, temperatures. Look for the mercury to remain in the 40s most of Thursday, then mid 30s Thursday night and lower to mid 50s Friday. 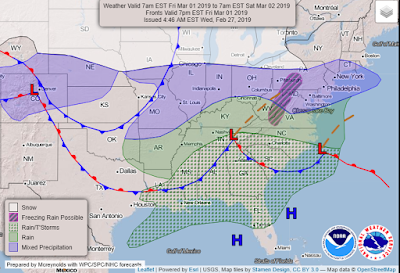 Models have had a hard time with the weekend forecast as Arctic air spills south towards the area and low pressure forms to our west and moves across the region. 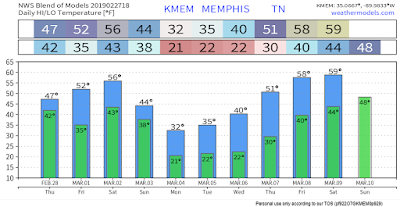 As of now, it appears Saturday may not be bad with most rain holding off until Saturday night and mild temperatures that once again climb back into the 50s to near 60. If you have stuff to get done outdoors, this is your day to do it! Saturday night is when the Arctic front starts dropping into the area as low pressure moves along the existing front draped over the region. Rain is basically a certainty Saturday night with temperatures in the 40s. Sunday could get interesting. 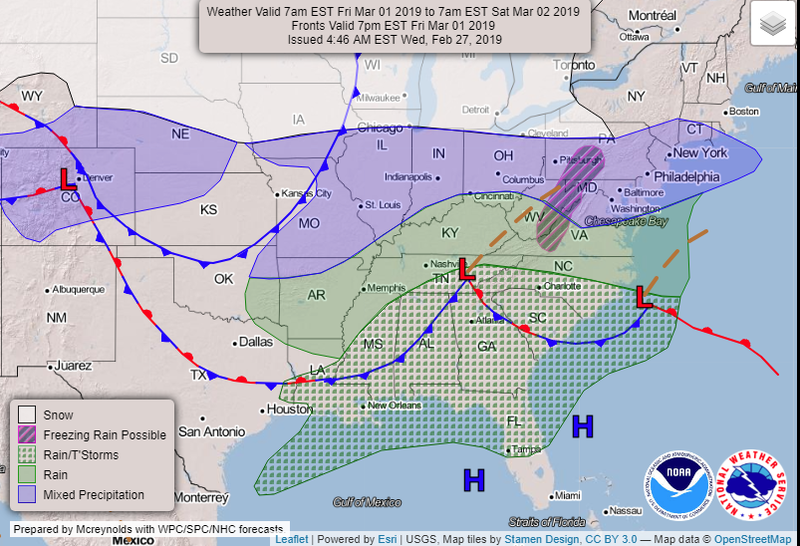 The speed with which the precipitation moves out Sunday, along with the surge of cold air moving into the region presents somewhat of a dilemma. Sunday morning will likely be wet, but the colder air will be plunging south on a brisk north wind. 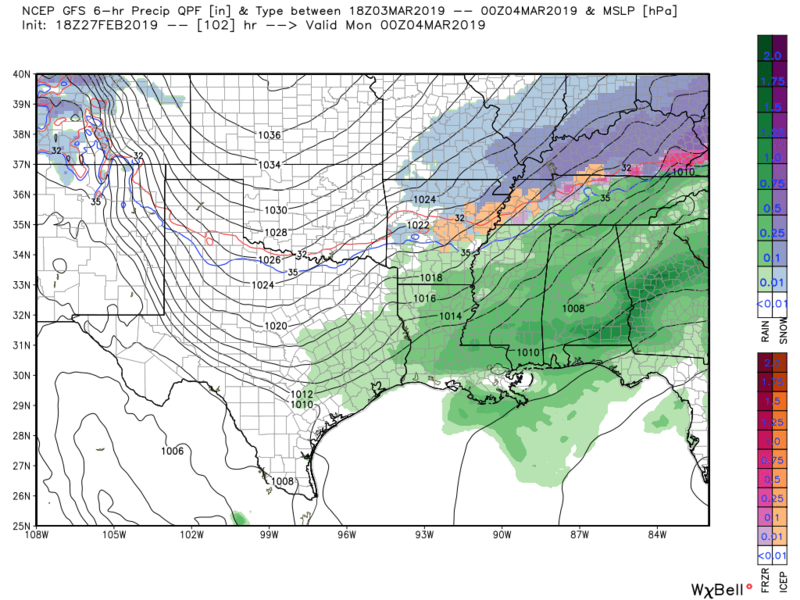 While the European model has been quick to push the precipitation out, providing for a dry afternoon, the American GFS model hangs some precipitation back in the afternoon and is a little faster with the cold air. It changes rain over to light freezing rain, sleet or snow Sunday afternoon as temperatures drop below freezing after a morning high in the 40s. The wind will also be brisk, meaning wind chills drop below freezing probably by noon and make it into the teens by evening. The GFS also is dry Sunday night though like it's fancy European cousin. 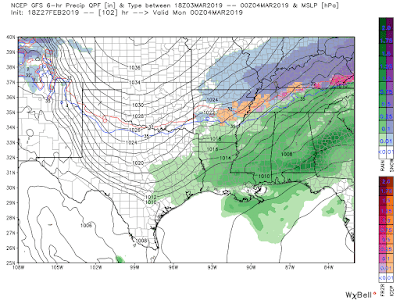 If the GFS is right, we could see a light coating of freezing rain or a dusting to light accumulation of snow. We'll need to monitor this situation carefully, as we're still 4 days out, but it's worth mentioning. Right now, I don't expect we'll see enough to have to worry about travel Sunday night into Monday. My gut tells me that this "cold air chasing precipitation away" scenario won't yield much if anything. But I've also always said, "winter isn't over until we get past the first weekend in March!" It appears this year, it might come in like a lion! Unfortunately, this isn't a quick punch of cold air and right back to spring warmth. I fear for the blooming flora across the region as a bitter airmass sinks into the region Sunday night through at least the middle of the week. 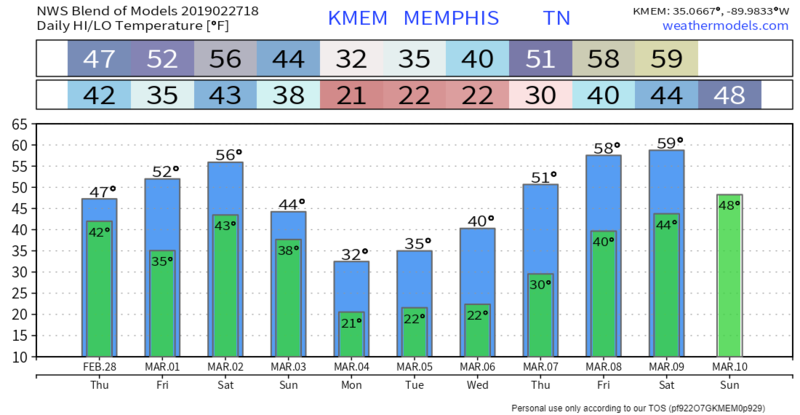 We'll easily see lows in the lower half of the 20s to start next week, perhaps for 3-4 nights, and a few mornings could see outlying areas in the teens. High temperatures may not get out of the 30s Monday-Wednesday! Hopefully this will mark the end of winter, but the long-range outlooks suggest cooler than normal temperatures (but not necessarily that cold!) stick around into the middle of March. Plan ahead for any precautions you'll need to take against a hard freeze for anything that is popping up out of the ground or blooming! 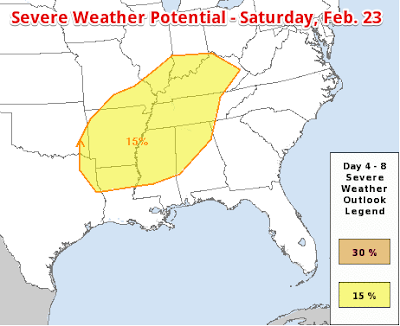 I may try and get a blog update done on Friday for more clarity on the weekend, but will be out of town Saturday as I represent StormWatch+ at Tennessee Severe Weather Awareness Day in Nashville. We've already had an early taste of severe weather season last Saturday. Despite the cold, it's also time to be giving some thought to severe weather preparation plans for this spring. 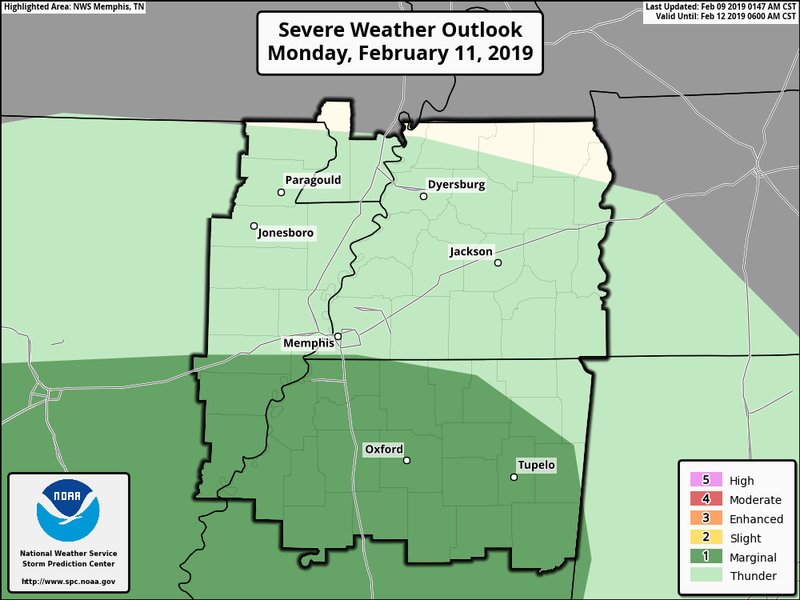 This week is Severe Weather Awareness Week in Tennessee and Arkansas, while Mississippi had theirs last week. Overnight storms, then severe storms -- but the end is in sight! The drumbeat of raindrops falling is incessant... and we're not quite done. 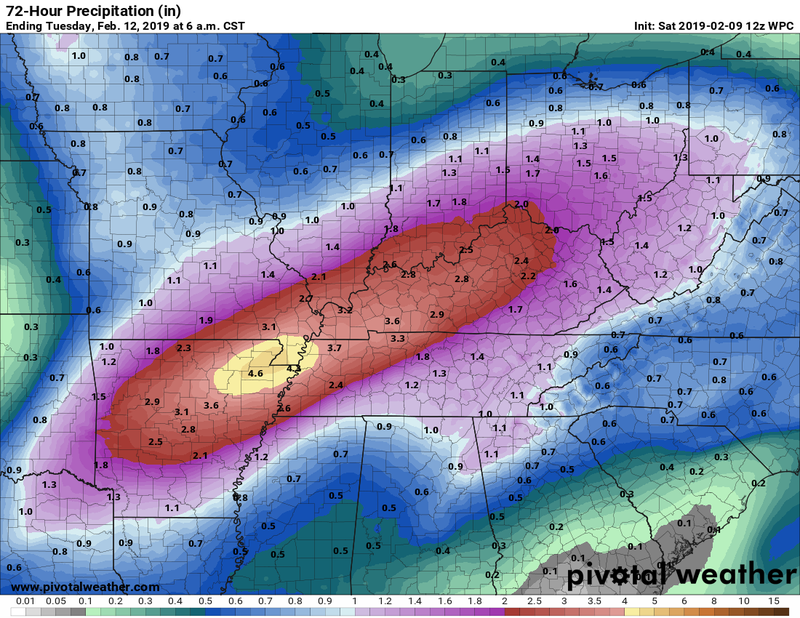 In fact, the next 24 hours or so pose more risk than we've seen in a few months, both in terms of the flash flooding potential and the severe weather risk. Let's start with the water, then move onto the storms. Continuous rain today, though perhaps not as heavy as what we've seen recently, is keeping things saturated. 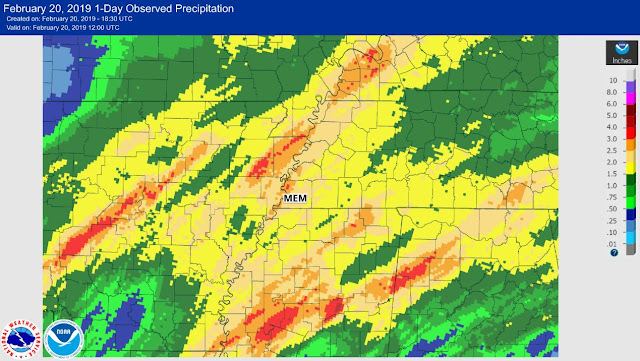 Metro areas in west TN and east AR have seen 1/3 - 1/2" of rain since sunrise this morning (as of 2pm) while northwest MS is likely pushing an inch. The heaviest rain since yesterday has been southeast of the metro where Flash Flood Warnings are in effect. Today's rain is on top of 5-7" the metro has seen in the past 2 weeks, as shown below. Steady rain is likely to continue this afternoon and perhaps into the evening, though high-res models disagree a bit on a potential break in the rain for the early evening hours. However, once we get into the nighttime, after about 10pm, a warm front to our south will lift north and cross the metro overnight, pushed by an increasingly strong southerly low-level jet stream a couple thousand feet up. That will result in periods of thunderstorms overnight, perhaps lasting much of the night. Rainfall will be heavy enough in these storms to be classified as "frog-stranglers" and "gully-washers," dropping up to 2-3" overnight, perhaps higher in spots. 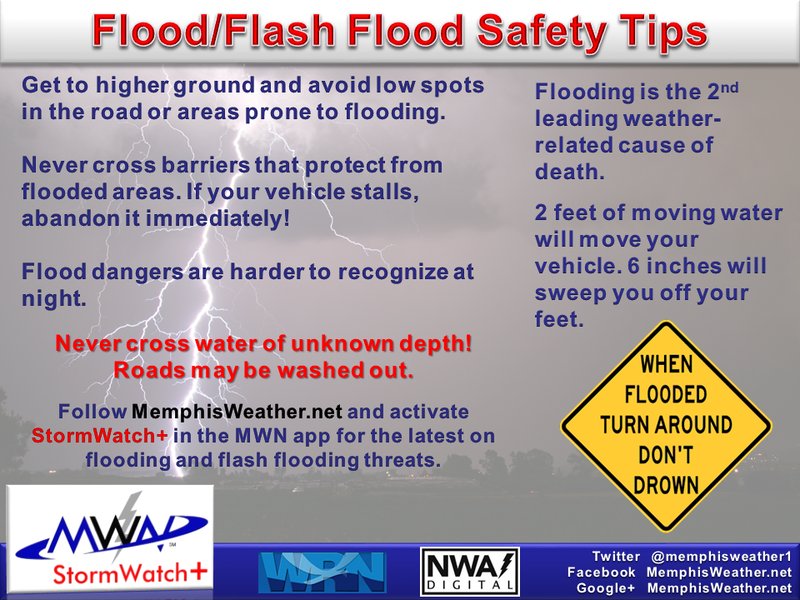 Flash flooding becomes a much more concerning trend as the night goes on, so if you will be out overnight, be extremely cautious! Creeks and streams could overflow, rivers are already high, and low-lying or poor drainage areas in the urban jungle could see accumulating water. 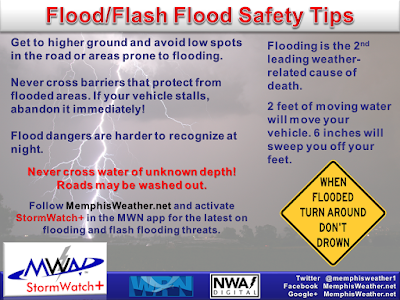 If you live near a creek or stream or other area that floods in very heavy rain, be aware that could happen overnight. The NWS Weather Prediction Center has the metro straddling the line between a moderate and high risk of rainfall that exceeds levels required for flooding, or about a 50% chance within 25 miles of you. North MS has already seen some water rescues in the past 24 hours - flooding is a threat to be taken seriously, particularly south of the state line! 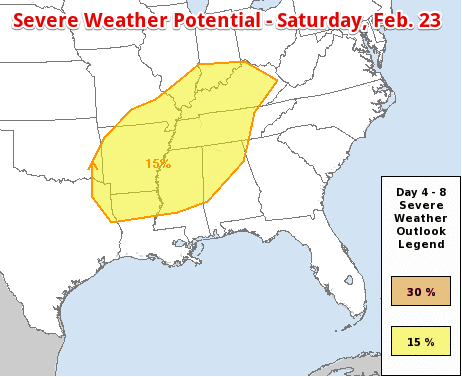 As far as storm threats, we're not necessarily expecting them to be severe. 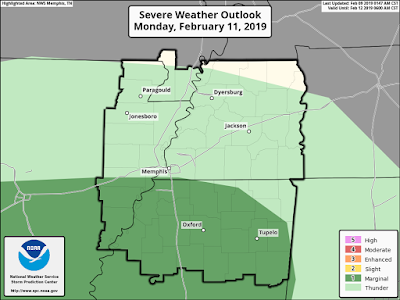 The Storm Prediction Center has our area on the edge of a Marginal Risk (level 1/5) for severe weather, with the possibility that a few storms could have some hail. Damaging wind and tornadoes are not currently expected overnight, but that doesn't mean the storms won't make a racket! If you had issues with storm noise Tuesday night, expect it again tonight (and it may last longer). Also know that due to the frequent lightning, power outages will also be possible. Once the warm front moves to our north, we should catch a bit of a break for a while Saturday morning. By about sunrise, the storms will be to our north and a humid, very warm, and increasingly unstable airmass will overtake the area. Temperatures in the morning will rise to near 70° with gusty south wind and hit and miss showers or a thunderstorm. The stage will be set for the potential for severe weather in the afternoon as a potent cold front cuts through an airmass characterized by strong, turning winds aloft (bulk shear over 50 kts and SRH near 200 for you weather nerds), sufficient instability (CAPE of 1000-1500), and plenty of available moisture at all levels (PWAT near 1.6"). Storms will likely form ahead of and along the front by late morning in AR and move our way by early afternoon. 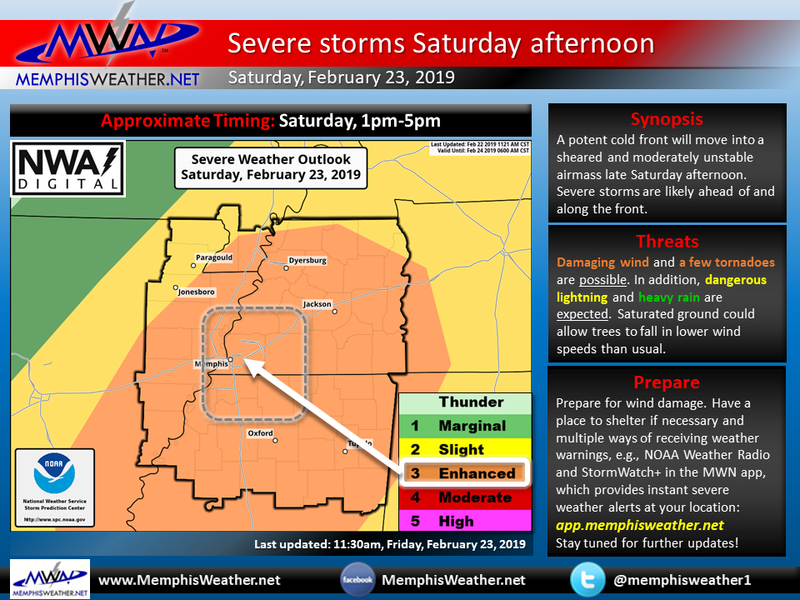 We are expecting a line of storms, with perhaps additional storms ahead of the line, during the afternoon hours Saturday, or roughly between 1-5pm. 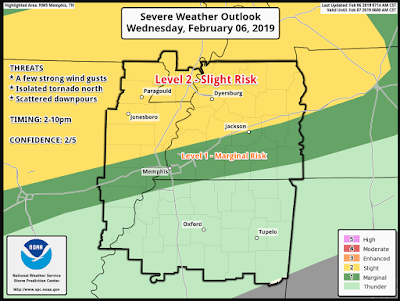 These storms will tap into the springtime atmosphere and have the potential to produce damaging wind gusts and a low threat for a couple tornadoes embedded within the line. 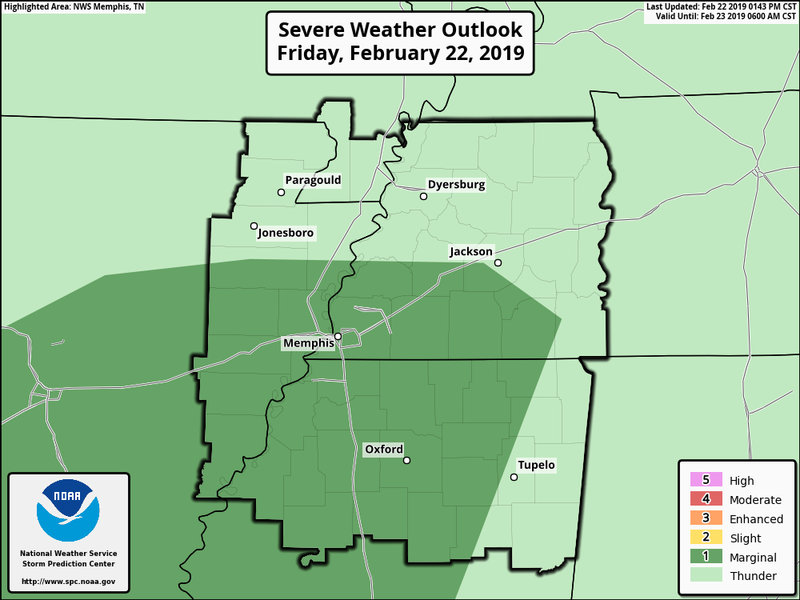 While the threat of damaging wind will be much higher (right now pegged at about 30% within 25 miles of any point), a Tornado Watch is likely during the afternoon as tornado probabilities are currently forecast at about 10% within 25 miles of you. Consider now what your plans are for Saturday afternoon and be prepared to take shelter wherever you are, if necessary. In addition, with the excessively wet ground, storms that produce sub-severe wind gusts (40-50 mph) may be sufficient to uproot trees and cause power outages. A Wind Advisory has also been issued for non-convective wind gusts to 30-40 mph Saturday would could pose an additional threat to trees with shallow roots in saturated soil. By 6pm Saturday evening, the storms will likely be gone and evening plans should continue with little concern. Moving into Sunday and early next week, I am pleased to report that it will be DRY with plentiful sunshine and seasonal temperatures. A few mid to late week showers are possible, but there is currently no threat of heavy rain that would cause additional flooding concerns as high temperatures remain in the mid 50s to near 60. 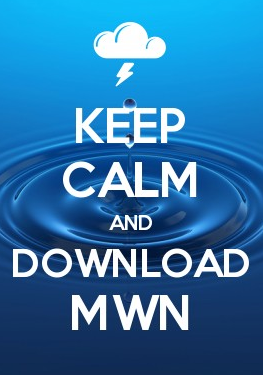 Stay tuned to our social media channels for the latest updates and be sure you have the MWN app downloaded with StormWatch+ Alerts activated for your locations of interest. Links are presented below. MWN friend Kristen Boyden asked a great question: "Why were Tuesday night's storms so loud?" 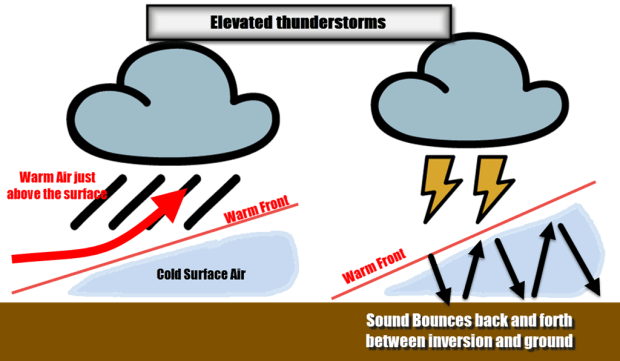 The overnight storms (and this is pretty common for nighttime storms and some during the day as well) were what we call "elevated thunderstorms." 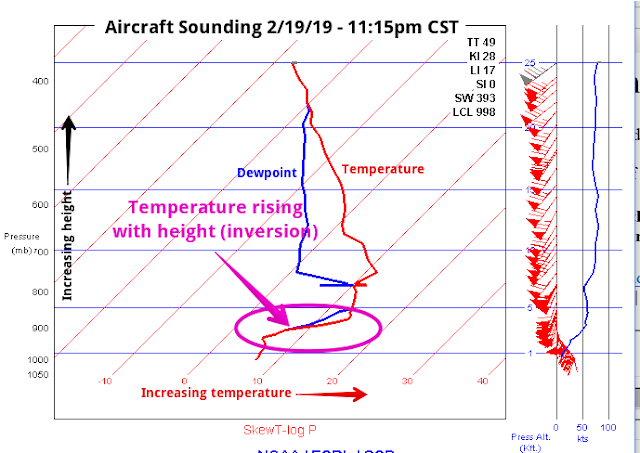 Basically, we had a very strong temperature inversion in place, in which the temperature rises with height rather than cooling. It was about 45° F at the surface during last night's storms, but 57° F at just 4,000 feet up! That inversion creates a stable layer in the atmosphere at the low levels and basically acts like a lid at 4,000 feet above us. When lightning discharges under that lid, the sound of the thunder is trapped close to the ground. Since the sound can't escape UP ↑, it bounces around between the ground and the stable layer above (the lid), amplifying the noise. It's like setting off firecrackers in grandma's pressure cooker! In addition, general daytime noise is reduced at night, so the thunder seems louder because the ambient noise level is quieter. (Like when your baby lets out a cry in the doctor's waiting room vs. in a house full of other kids!) I frequently say that thunder at night is often louder than during the day, but in fact, ELEVATED thunderstorms are truly the cause for the noise level. They just happen to occur more often at night! It doesn't mean they are "more severe" or even more damaging. They're just louder. Our rain has finally gone away, but unfortunately it won't stay that way for very long. Multiple rounds of showers are expected to return starting tomorrow, with some severe thunderstorms being possible on Saturday. Over the past day, most of the Mid-South has seen between 2 to 3 inches of rain. 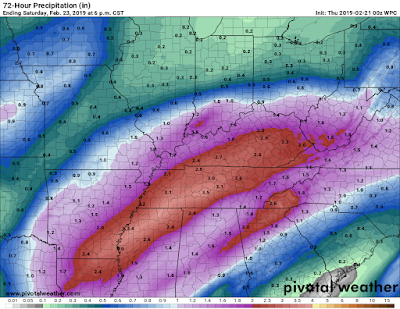 Unfortunately, a lot more rain is expected from tomorrow through Saturday. We will not begin to transition away from this perpetual wet period until next week, but even then the ground will still be pretty soggy. Skies are expected to continue clearing out for the remainder of the day. While we won't completely clear out during the daytime, we could get a glimpse or two of some sunshine by this afternoon. As for this evening into the overnight hours, skies will continue to clear leaving us with a mostly clear sky overnight. Conditions will be favorable for some patchy fog to develop in outlying areas. Temps will dip back down to near 38 overnight so a bit of frost is possible on your car if you park outside overnight. The first half of tomorrow will actually be pretty nice. Clouds will remain, but we may get a peak or two of sunshine in the morning. By tomorrow afternoon, clouds will continue to increase ahead of our next rain maker with highs nearing 52. Scattered showers will arrive during the afternoon hours with even more showers expected in the evening and overnight hours. A thunderstorm or two is possible, but we are not expecting any severe thunderstorms with this round of precipitation. 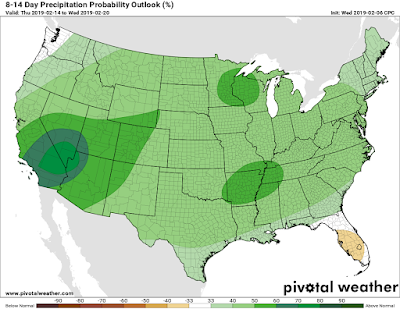 Friday appears to be a continuation of Thursday evening, with showers across the area. Once again, a thunderstorm or two is possible during the day, but we are not expecting any severe thunderstorms. Highs will reach near 58. Showers and a few thunderstorms will likely hang around into and through the evening hours on Friday as well. 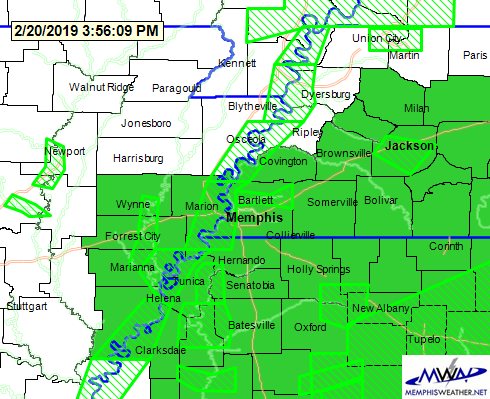 Latest hazards map outlines Flash Flood Watches in green with Flood Warnings in the hatched lime green. While it is still a few days away, we will need to keep an eye on things on Saturday. Showers and thunderstorms are expected through the day on Saturday, but severe thunderstorms appear to be possible for the afternoon hours (timing will become more refined as we get closer). 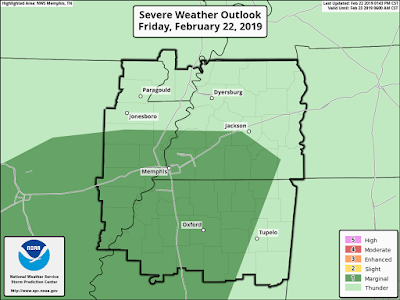 A combination of highs reaching into the low 70s (yuck), along with plenty of moisture (dewpoints in the "muggy" category), strong wind fields aloft, and the arrival of a potent cold front leads to this severe weather potential. The main concerns with this system are damaging winds, but there is a low-end tornado threat as well. 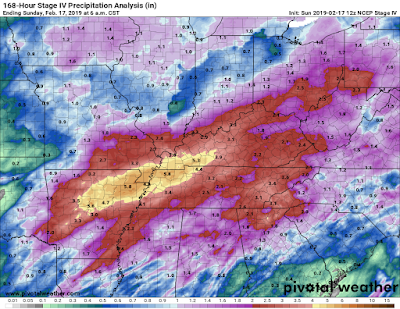 Additionally, since we have seen so much rain already this week, any more rain we see (especially heavy downpours), could become problematic over some areas. Also, due to very saturated ground, wind gusts could uproot trees at a lower speed than would typically be required. Like I mentioned before, we are still a few days away with lots of details and logistics to be figured out. It is worth mentioning and definitely worth keeping an eye on. We will finally get a small break from all of this rainfall next week. Sunday and Monday look to be clear with the possibility of a shower or two by midweek. Temps will remain right around average, leaving next week looking pleasant to "normal". 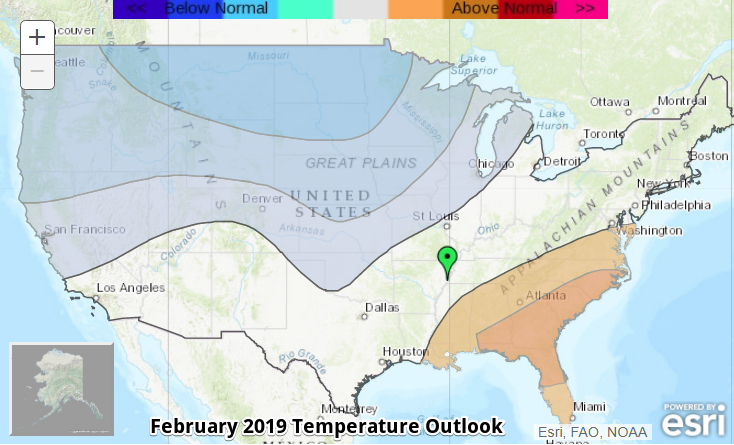 For those wondering when/if winter will come back, it looks like temperatures may return to below average by the following weekend, but that's getting a bit into la-la-land forecast. I know we're tired of the rain, but another very wet week is ahead. 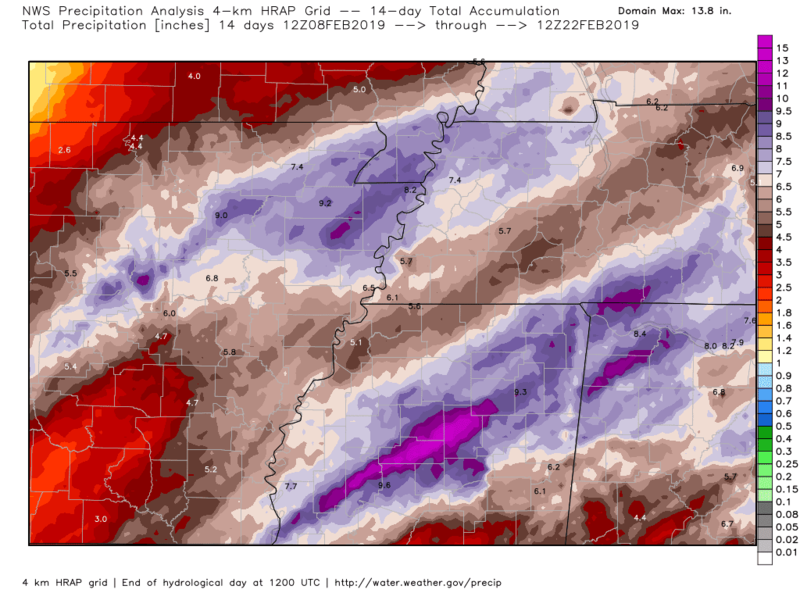 The potential for flooding and flash flooding exists with heavy rainfall Tuesday into Wednesday and again Saturday into Sunday (next weekend), though rain chances occur nearly every day this week, except Monday. 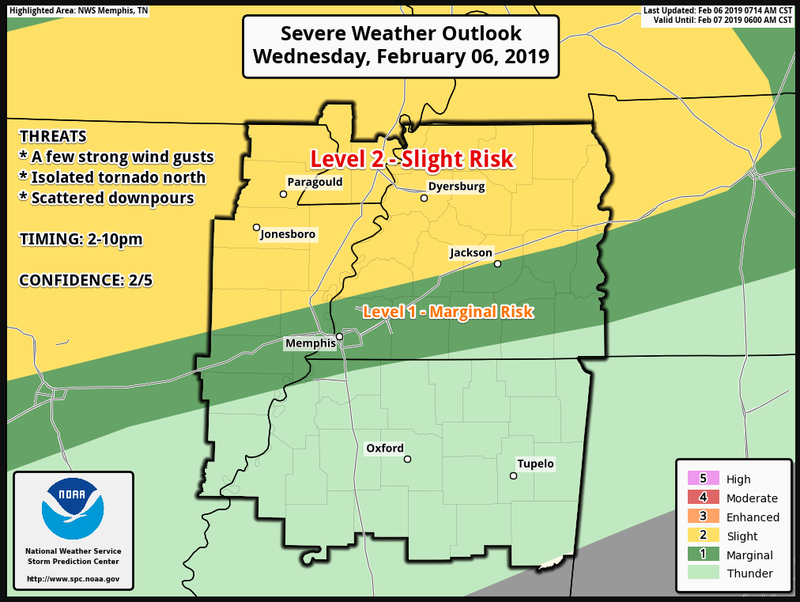 Watch the video forecast discussion below for all of the details or check out the graphics below for a high-level overview. 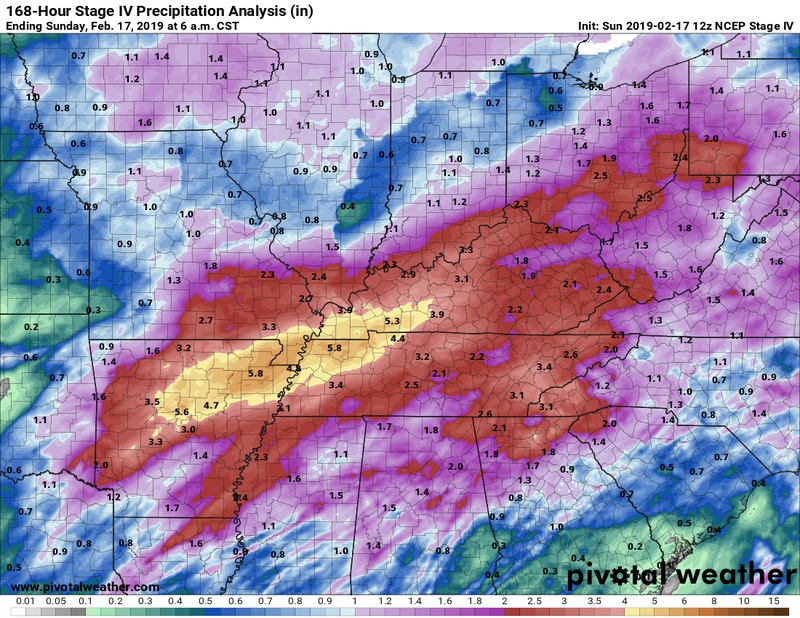 Stay with us all week for the latest on the heavy rain and potential for flooding, as well as forecast updates as we tweak the timing and amounts of rainfall with each system as it approaches. Links to where to get all this information can be found below, and certainly be sure to download the MemphisWeather.net app for all of it in one neat little package, including StormWatch+ Alerts for flood and flash flood alerts for your location. Stay dry (as best you can!) and stay safe! Spring, winter, spring... what season are we in again? Wow, what a stretch of warmth! After suffering through winter's chill last week (but not nearly as badly as those in the Midwest did), the rush to spring was swift! The string of 70-degree days has reached 5 days as of today and will likely reach 6 days tomorrow morning before things change, a lot. But before that front hits, we should tie the record for longest streak of 70° days in the month of February, and the 2nd earliest stretch of consecutive 70° days on record, bested only by Jan 3-8, 1880. Yes, 1880. None of us remember that. With a cold front sitting to our north, the metro sits in a "warm sector" (basically a February sauna) with scattered showers and thunderstorms fueled by warm moist air transported north from the Gulf on southerly wind. 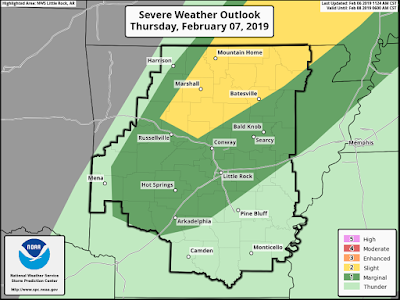 Areas primarily north of I-40 are under a low-end risk of severe weather. I'm not overly concerned about it, but a few storms north of the metro could see a few strong wind gusts. There's also a very low, non-zero, risk of a tornado, but that is more likely closer to the front to our north as well. The risk of a few storms continues into the evening hours before they lift north of the metro as a warm front pulls north in response to the cold front approaching from the west. A few showers are possible overnight, but nothing strong or particularly wet (other than the humidity levels). The warmth continues into Thursday morning as the front moves across AR. Rain and a few thunderstorms are possible in the morning until the front arrives, which will bring an abrupt end to our 70 degree weather! 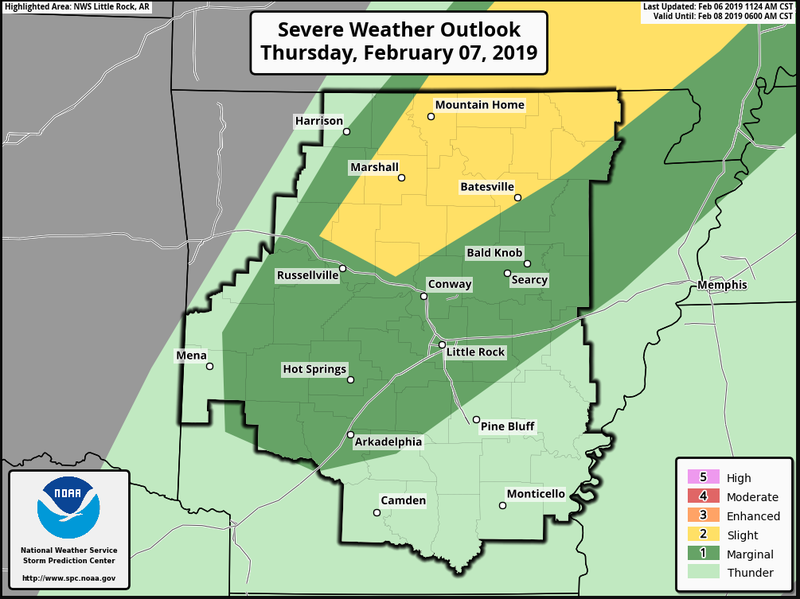 Severe weather outlook for Thursday, via SPC. In addition to the muggy air in the morning, strong and gusty south wind will reach 30-40 mph. 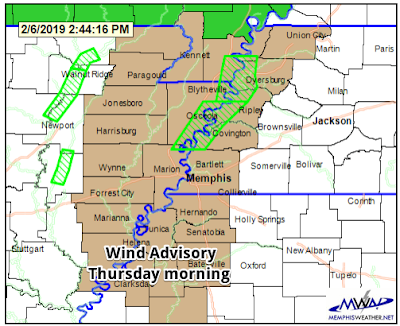 A Wind Advisory (a.k.a., "Skirt Alert") is in effect for counties bordering the Mississippi River and west into eastern AR. Finally, bouts of heavy rain over the next 24 hours will likely result in 1-2" of precipitation in the metro. Not flooding rain by any means, but localized ponding could occur in and just after the heaviest downpours. By early Thursday afternoon, the front swings through the metro (called "FROPA," or frontal passage, in your local weather discussion). You'll know when it does if you happen to be out. If you won't, you'll definitely know when you leave work or school later in the afternoon! Showers continue behind the front, but the warm air will be quickly pushed east. Temperatures will fall precipitously, likely reaching the 30s by evening (from near 70 at noon). Depending on your bent, fortunately or unfortunately, the rain looks to end before the "cold enough" air arrives, as is typical. No snow. We end the week with the only guaranteed dry days in the entire forecast period, and of course that is when the cold air is here as well. Wake-up wind chills Friday morning will be in the teens with temperatures in the 20s. Cool north wind continues Friday with a high of (maybe) 40. Saturday sees more of the same with lows again in the 20s, chilly wind, and a slightly-moderated high temperature in the mid 40s. 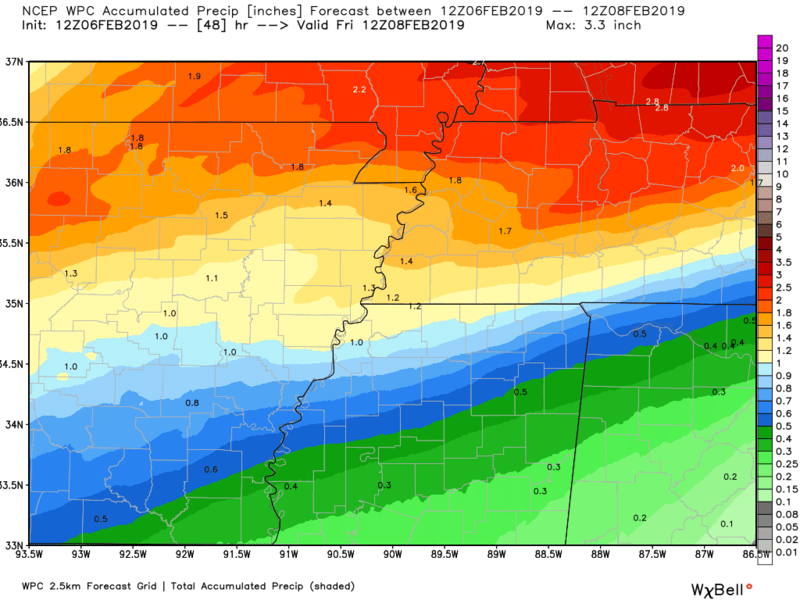 As cold high pressure pushes off to our east, we once again get stuck in a wetter pattern with multiple low pressure systems moving across the larger Mid-South region, dropping buckets of rain. This has been advertised for some time by the week 2 outlooks from the Climate Prediction Center. Below is today's outlook. 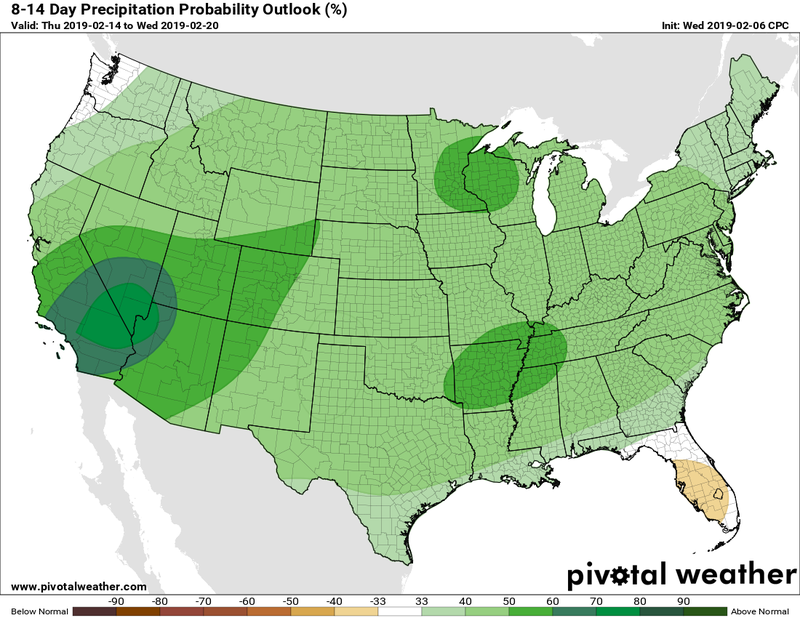 It indicates above average probabilities of above average rainfall. 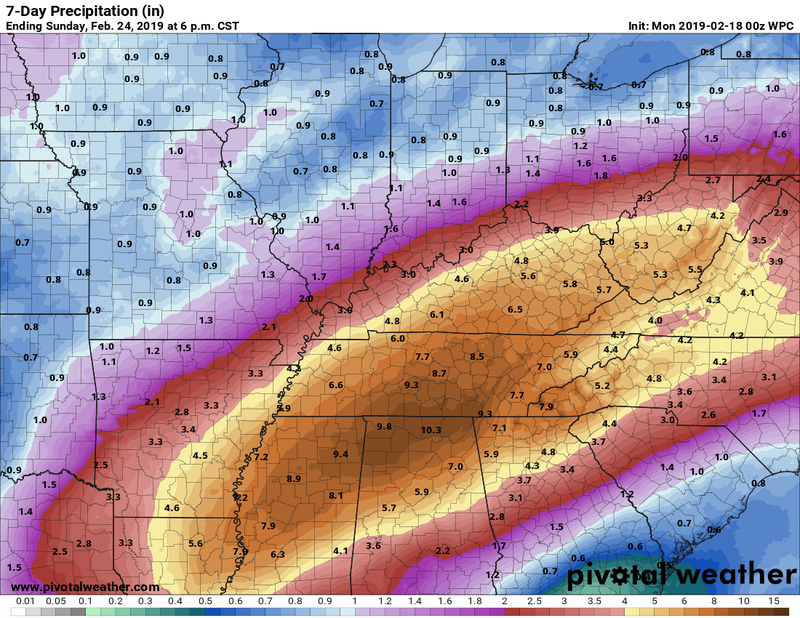 I guess that means our area excels in precipitation. It does appear that cold air will be held at bay, so temperatures should be seasonal amongst all the rain. Keep up with the latest on our wacky weather pattern by following MWN on social media or downloading the MWN app for the latest forecast, radar, and severe weather alerts! Links are provided below.